1) Cut the pastry into approximately 13 cm by 24 cm rectangle and place on a baking paper. With a knife score a border around the rectangle approximately 1.5 cm from the edge. 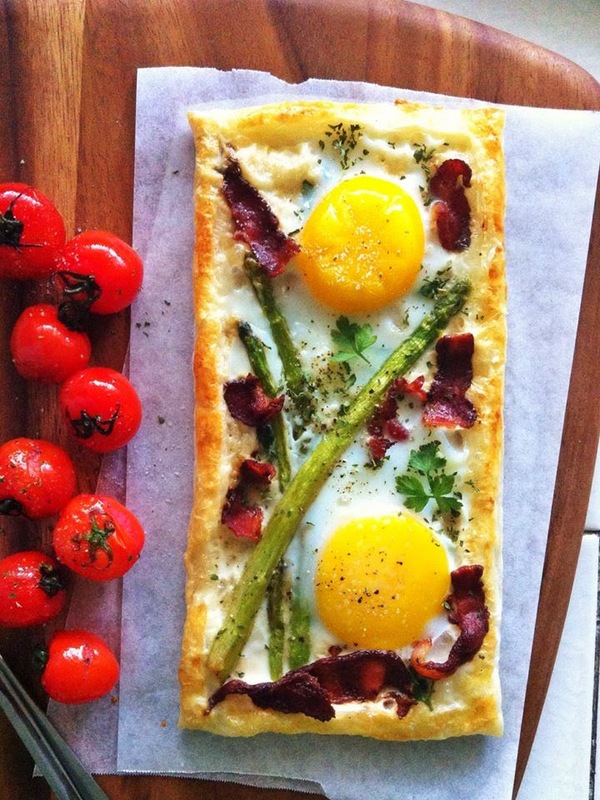 Using a fork, prick the center area of the dough and brush only the border with the egg wash.
2) On a baking tray place a baking paper and strips of bacon on one half and the asparagus on the other. Sprinkle asparagus with olive oil, salt and pepper. Put in oven and bake for about 10 minutes. Or it can be pan fried. 3) When you remove the asparagus and bacon from the oven, place the dough on a baking paper instead and bake for about 8 minutes. If the dough fills up with air and starts to bulge, pierce it with a fork. 4) In a heated small pot, mix the milk with the thyme. Add salt and pepper to taste. leave to cool. 5)When you remove the dough from the oven, press down the center with back of spoon and spread the milk mixture evenly on the center of the pastry dough, keeping the border clean. Sprinkle with cheese and then place the bacon on it. Crack the eggs onto the pastry and then place the roasted asparagus spears. Egg wash the rim again if needed. Bake until the egg whites are set and the yolks are still soft, about 8-10 minutes.